In today's time day by day general category student condition is becoming worse due to some foolish rules. It is very difficult or say impossible for general category student to get a job and admissions in good colleges. If a general student has to take 90 marks to appear the test the the SC category student has to score only 45 marks. This will lead India to down fall. It also leads to lack of confidence.Today we also see that government schools are not so good as compared to private schools as in private teachers are taken on the basis of ability where as in government schools teachers are taken on the basis of category not ability which is a big draw back. I agree that this reservation policy acted as boom for India on older day but now if it is not given brake it will destroy India. All are having equal brain then why discrimination. 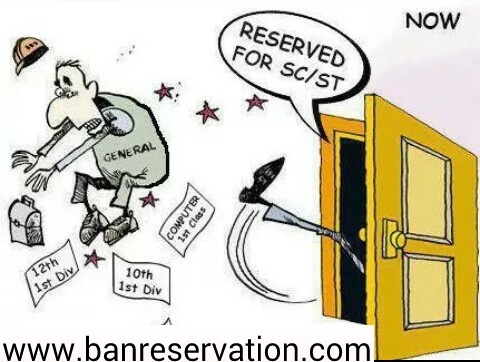 Instead of giving reservation government should remove it and make one category. It will lead to equality in citizens and also lead to peace of mind and tension in general category students which is increasing day by day with this discrimination on the basis of caste. Which come forward us when we have to take admission in good collage and give entrance test but we can't. India is backward in many field, if India overcome this reservation problem then we will see India only rising up. The day when India will become reservation free country will be remembered by all and treated as holiday. All the persons living has two eyes, Two legs and one brain. Or our science proved that general category students are having two brains. Then why discrimination. God make us equal then question comes why reservation?? ?